SO. Someone on Instagram left a comment asking me why I use lemons in all my recipes. My response? I really enjoy lemons (plus they are really good for you). Why else would I use them, you know? Okay, but in all seriousness, this comment wasn’t said in a nice way, and I obviously do not use lemons in ALL of my recipes. Maybe a good amount of them, but let’s just be real, you guys know I like to switch things up! But hey, it’s spring, and I’m in a lemony kind of mood, so I’m going with it, and loving every bite. Plus, I feel as though I’m not alone in my love of lemony things. Pretty confident that like me, a lot you guys enjoy a touch of lemon flavor too. And guys, if you do hate lemons, there is a simple fix, just leave the lemon out. Problem solved. I am pretty excited to share this very easy pasta recipe with you guys today! 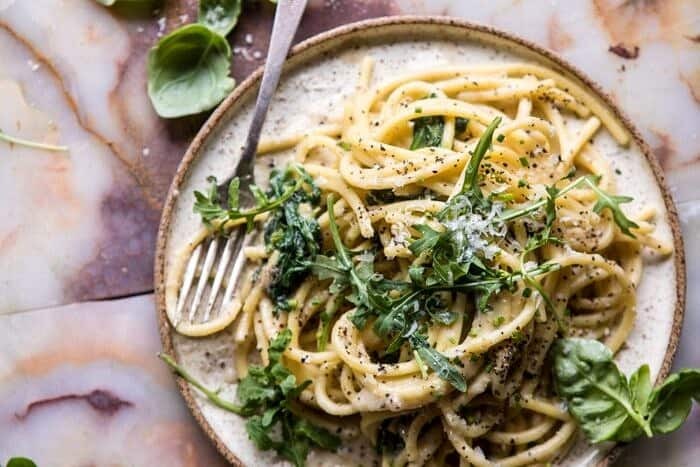 I’ve hesitated making Cacio e Pepe for so long for the sole reason that it’s truly so simple and so easy that I didn’t feel I needed to tell you guys about it. But then something happened. I made this recipe for my friends over at The Chriselle Factor and I immediately fell in love with it. Of course, me being me, I added an extra ingredient or two, to add in that extra touch of flavor and give the recipe my own personal flare. But all in all, it’s very similar to the classic pasta eaten all around Italy. And of course, it’s delicious, easy, and quick. A little background. Cacio e Pepe literally means cheese and pepper. It’s like mac and cheese, but simpler and quite possibly better. When looking at the recipe you might think it seems a bit basic, that’s because it is basic. BUT with good pasta, a little butter, fresh black pepper, and really good cheese, it’s also basic(ally) perfect. You see what I did there? Basic…ally? Yeah, in my head it works…just go with it. The key to this recipe is the pasta cooking water. You simply cannot make this without that pasta water, as it’s the water that creates that creamy and luscious sauce. This also means there is zero cream in this pasta recipe, which I dunno, kind of makes it health…ish, right? There are greens too. And lemon! So yes, yes, healthy…ish. Again, just go with it. SO, here is how this works. You ready? It’s simple. Boil a large pot of water, add the pasta and cook. Reserve a cup of the pasta cooking water and drain. Heat the butter in a skillet with pepper, add in the pasta water and the pasta. Sprinkle all that cheese in, and toss, toss, toss. Remove from heat, add a couple handfuls of arugula and basil, and divide the pasta between plates. Finish with lemon, plus a dusting more of parmesan cheese. 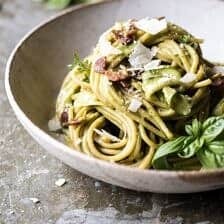 It’s not often that I make such simple recipes like this pasta, but I do believe that everyone needs a recipe like this Cacio e Pepe in their back pocket. It’s made from pantry staple ingredients, takes maybe fifteen to twenty minutes to make, and is really delicious. Meaning it’s perfect for those nights when you have nothing in your fridge, or a night when all you feel like doing is eating pasta and binge watching Netflix, or even a night when a surprise guest shows up and you need to come up with a tasty meal to satisfy everyone…fast. This is that magical pasta that will save the day. And again, the addition of those leafy baby arugula greens and lemon zest totally make this a very “well-balanced” meal. Don’t you guys just love my way of rationalizing things? My mind works in surprisingly great ways…sometimes. Enter that wink, wink emoji here. 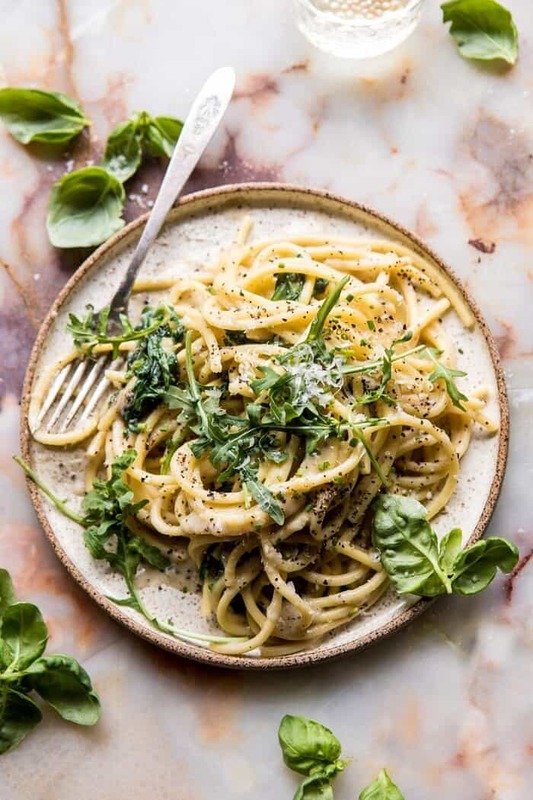 Cacio e Pepe with Arugula and Lemon from Half Baked Harvest on Vimeo. Made from pantry staple ingredients, takes 15-20 mins to make, and is really delicious. 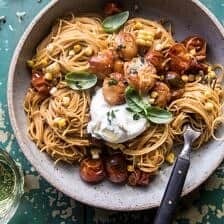 Meaning this dish perfect for those nights when there's nothing in your fridge, or all you feel like doing is eating pasta + binge watching Netflix, or a surprise guest shows! 1. Bring a large pot of salted water to a boil and cook pasta according to package directions until al dente. Just before draining, reserve 3/4 cup of the pasta cooking water. Drain. 2. Melt 2 tablespoons butter in a large skillet over medium heat. Add the pepper and cook 30 second to 1 minute, until toasted. 3. Add the reserved pasta water and bring to a simmer over medium heat. Add the pasta and remaining butter. Reduce the heat to low and add the parmesan and pecorino, tossing until melted. 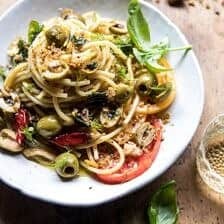 Remove from the heat, add the arugula, toss until the greens are wilted and the sauce coats the pasta, adding in more pasta water if needed to thin the sauce. Transfer to a bowl and serve topped with fresh basil and lemon zest. Enjoy! Thursday night + pasta + chill time = my kind of night. I’m excited, what are you guys doing?! 20 Minute Basil Cashew Chicken. Thank you so much Maike! I hope you love this Ruth! Thank you! It’s so great to read your recipes you are so creative. 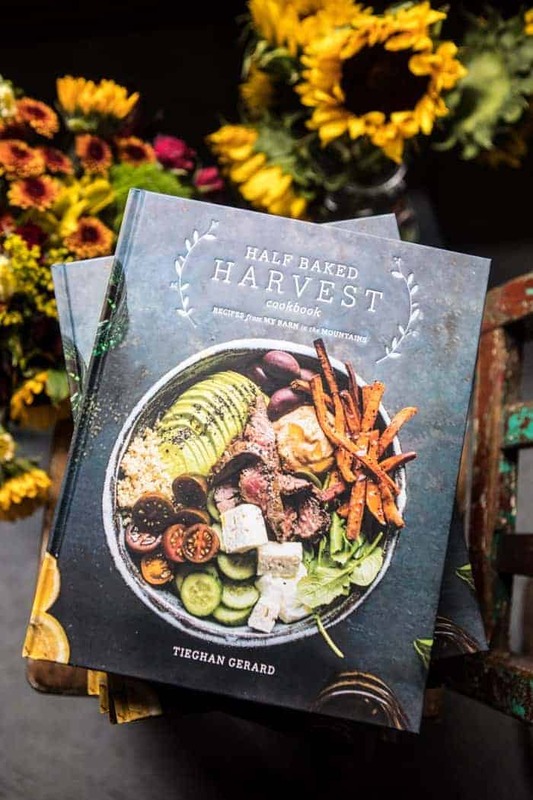 Your photos just make me want to create, cook and eat all the recipes you share…. Keep up the good work and don’t worry about those who always have something to moan about. Thank you so much Orsi! I am so glad you like my recipes! Thank you-thank you for a back pocket recipe. Leaving for NY for 5 weeks to help with twins while DIL goes back to work. Goal is to adore my grandbabies and have supper on the table. This recipe will be a home run. I have a pound of Colavita bucatini, a delightful black pepper to crack and arugula in the refrigerator. 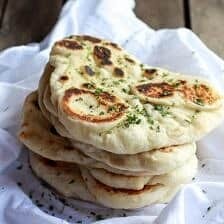 An almost simple and flavor filled recipe! And if like me you live in the Mediterranean, Lemons are abundant and cheap at the moment, so why not use them.. in everything.. Yes! I hope you love this Paula! Thank you! Anyway, to put it more nicely: Love lemons, love your recipes (lemon or otherwise), thank you for providing a nassive service for free!!!! Most well known chefs, ina garden, Giada, etc typically incorporate or finish a savory dish with a squeeze of lemon or zest or both. I made the one pan chicken and orzo dish of yours last night and didn’t have a lemon or kale…. made it anyway and used real lemon juice (don’t judge me). I served it with a side salad since I didn’t have the greens…the dish was almost as good, just didn’t have the extra visual appeal of the sliced lemons and greens. Sometimes you got to improvise and honestly to pick on you because of lemons…. small brained. Like a bad tv show… change the channel, leaves it out, move on! You’re fine! Keep doing what you’re doing! Love your freshness! 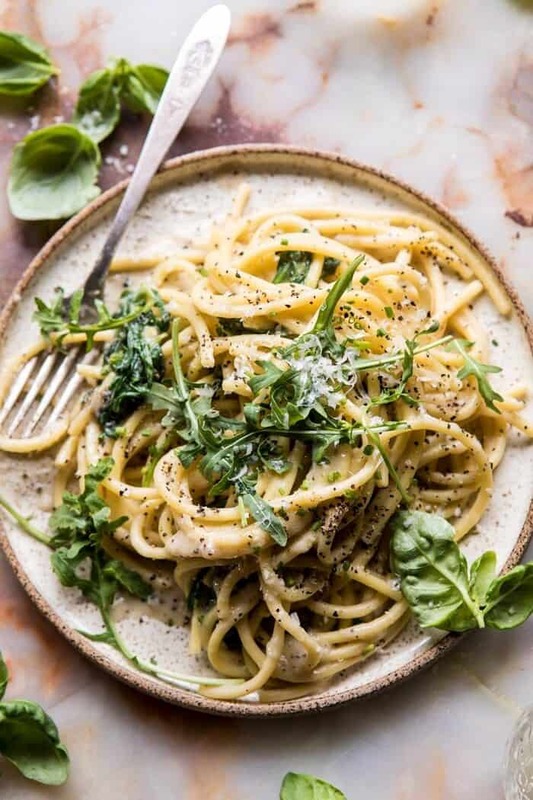 Great twist on a classic but Cacio e pepe means cheese and pepper. This pasta dish is really all about fresh cracked pepper and fresh grated cheese. 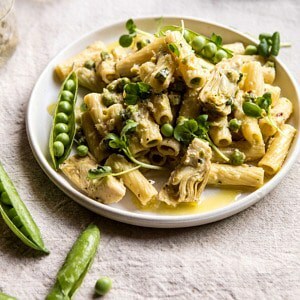 The pasta water is a must as in many pasta recipes but makes this a quick meal. Many chefs add lemon to their dishes because it adds a freshness to them. Lemon is a must and you do not overuse it. 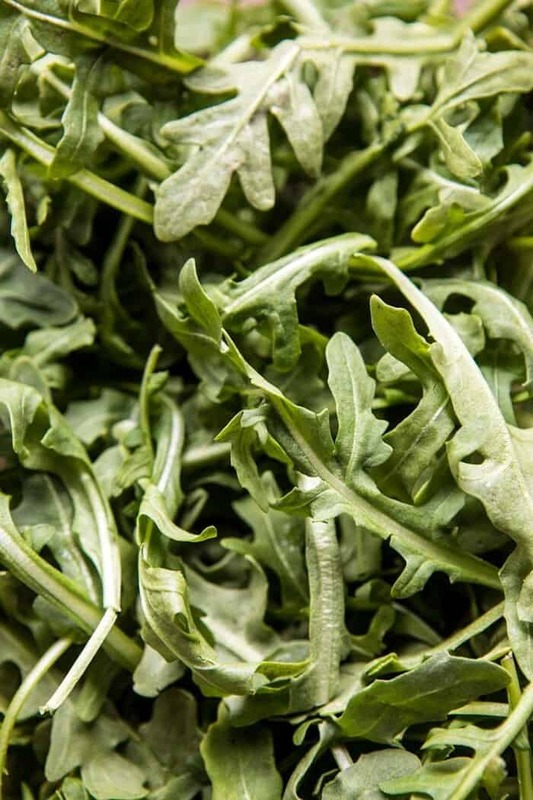 It’s like adding salt to a recipe(actually lemon can be a healthy salt alternative) The arugula just repeats the peppery flavor and would be wonderful. Nice touch. Sometimes basic is awesome! 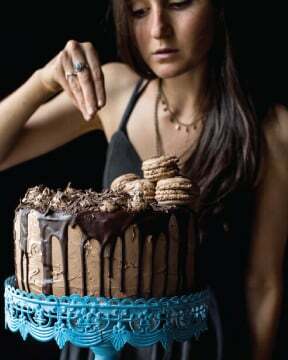 I can’t wait to make this soon! I got your recipe for the cauliflower shawarma in the morning yesterday and had it for dinner last night– SO GOOD! I make your recipes almost every day- actually I really can’t think of a day I don’t- and I think you use the perfect amount of lemon 😊 Keep up the great work!! Thank you Amy! I am so glad you like this! Hey guess what – your food is DELICIOUS and you don’t need to defend yourself or your recipes. Shake it off girl. AND I LOVE LEMONS. That lemon orzo kale skillet meal is on repeat here. It’s ridiculous. Go team lemon! Love your attitude. Keep on rocking ! I love all your recipes. After experimenting with them, I am amazed at the power of a lemon or lime, what the addition of a pablano pepper does and the power of paprika and chili powder, not to mention the wonders of the pasta water. Thanks for everything you teach us everyday!!! I use lemons in a lot of my recipes. It’s a pretty common ingredient with numerous culinary applications. What a bizarrre and embarrassing thing to moan about. Great recipe! I love your recipes, and look foardward to trying this one. Citrus is great, too. Always adds a nice touch. 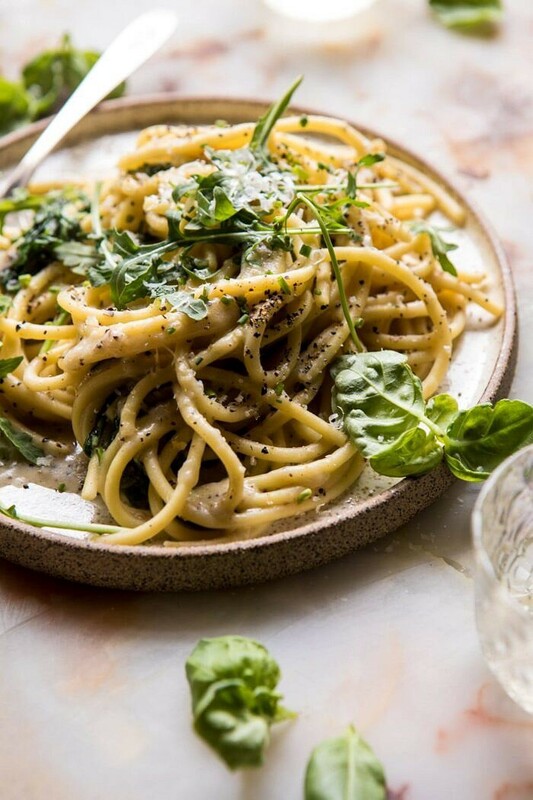 I think cacio e pepe translates to “cheese and pepper,” but otherwise, beautiful recipe. 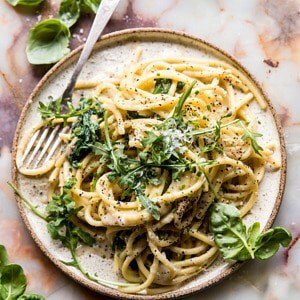 Very similar to Chrissy Teigen’s lemon arugula cacio e pepe recipe from her first cookbook! A little different and can’t wait to try it your way. I LOVE lemons in cooking! They add such a nice freshness, and especially with it being lemon season, I would expect to see a lot of lemons! I got a comment on a recipe sometime that said “I would never make that.” I was just like ok…..
Anyways, I love the addition of arugula in this. What a delicious sounding recipe (even though it uses lemons). Thank you Danielle! It is so nice to hear that you like this recipe! MY 20-SOMETHING, VERY SAVVY GRANDDAUGHTER IN SF, TURNED ME ON TO YOU! WOW, I CAN HARDLY WAIT FOR YOUR NEXT IDEA. SENT AWAY FOR YOUR BOOK IMMEDIATELY. That is amazing! Thank you Karen! At 5:30 I was laying down with a heating pad on my back. Tired and NOT in the mood to cook dinner. 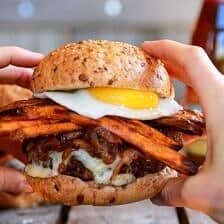 I looked at the daily blog post and this recipe appeared. I swear it was a gift! Had all the ingredients (extra protein spaghetti instead of bucatini) but it was wonderful. The lemon zest made it perfect!!! That is so amazing Lynn! I am so glad you liked this recipe and your family did as well! I hope your back is doing okay too! Thank you! More lemon! Always more lemon. Especially in a recipe like this, It just makes everything else shine. YUM! The Italian word for “pasta” is “pasta”. Love you & your recipes so much! I love this pasta and the addition of lemon! Haha my mom loves lemon too, and they always remind me of her. Maybe you could do a lemon tart with spring berries? I do like the addition of peppery arugula! What shows do you usually watch? Do you watch any documentaries? I hope you’re having a nice night and I’m excited to try this recipe! That tart sounds like something I need to do! YUM! Thank you so much Kristin! I love that!! Thank you so much Denise! I also add a little lemon zest into creamy pasta dishes because I think it really brightens it up and cuts through the creaminess! I will definitely be trying this, love the addition of argues, great idea! Thank you so much Casey! I hope you love this! Hello, I plan to make the arugala pasta. I would like to use olive oil instead of canola oil. Great! I hope you love this recipe, Shirley! Let me know how it turns out for you! Yum! I hope you love this! Thank you! If I don’t like the taste of arugula, would you suggest spinach? Or a different leaf? I made this tonight and made no changes. Lemon should go with all non marinara pasta dishes in my opinion 😁 my husband loved this and went back for a full plate of seconds! Definitely a keeper. 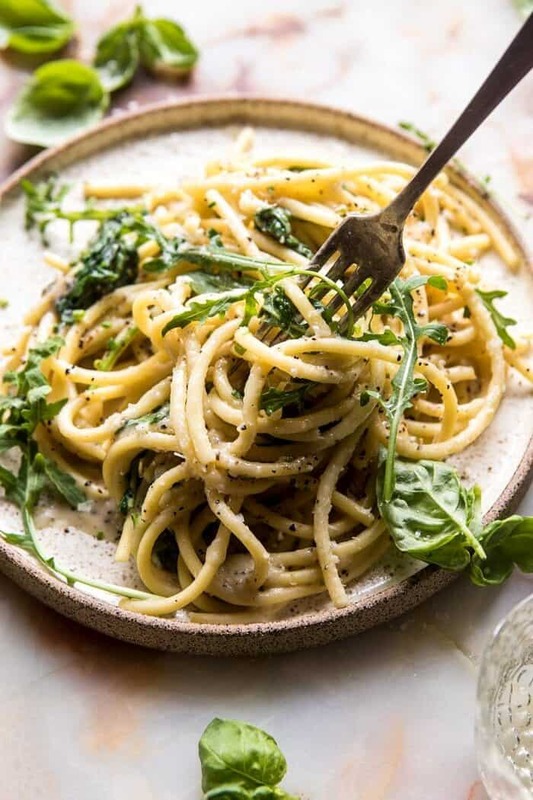 Cacio e Pepe is favorite quick recipe at our house when I need to get to the grocery store and have no time, am cooking for myself, or cooking dinner really late. I often add a fried or poached egg on top for protein. Love the addition of arugula and lemon. Making it tonight! This was amazing…can’t wait to make it again! This recipe is absolutely amazing! Thank you!! My boyfriend and I made it tonight- we subbed spinach for the arugula (the store was out) and we added tomatoes. We didn’t have fresh basil so we mixed basil into the pasta dough! I studied in Rome, Italy during college, and cacio e pepe was a popular dish there. 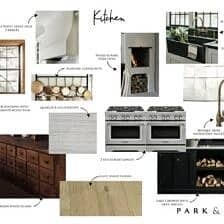 I just recently came across your website and I am hooked. Looking forward to trying more of your recipes! Thank you so much Tara! I am so glad you loved this recipe! I made this the other night and it was fantastic! I loved the addition of the peppery arugula. My finicky husband, my forever-hungry 15-year-old, and my two-year-old loved it. In fact, my toddler had 2 (toddler-sized) helpings. That is so amazing! I am so glad your entire family loved this recipe Marie! Thank you! Thanks for this simple and elegant recipe! Thank you Susana! I am so glad you liked this! Love the recipe and texture. Will definitely try to make this recipe for my mother. I hope she loves this! Thank you! Hey Betsy! 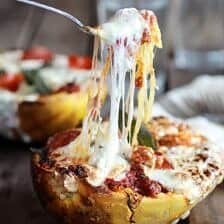 At what point did you add the cheese and what kind of cheese are you using? It is important to use a higher quality cheese that will melt into the sauce. Also, are your bringing the sauce to simmer before adding the pasta? This is an important step that helps bind the sauce with the butter. What’s so beautiful about Italian cooking is it’s simplicity. No reason to not think this dish is worthy of being on your site. Cacio en Pepe is utterly delicious. Can’t wait to try your recipe. Can you tell me where you purchased these plates? This dish is so tasty & comforting! Just some notes/changes that I made: served with roasted butternut squash because I didn’t have arugula; used parmesan and gruyere cheese. I know this is a weird combo . . . . but it tasted sooo good!! I did not add basil or arugula but did include some freshly squeezed lemon juice (thanks to my girlfriend’s tree). Sooo comforting! so good. So good that I just made it again for lunch. This time I added the arugula (went to store this morning). Still amazing!! Thank you!! Hi Teresa! I am so glad you loved this recipe! Thank you so much for trying it! So simple and SO good!! Loved it.